PT Reasuransi Indonesia Utama (Persero) - PT RIU or known as "IndonesiaRe" is a well-known state-owned company with its core business in reinsurance industry. Headquartered in Jakarta, IndonesiaRe engaged in providing a comprehensive range of life reinsurance and general reinsurance. IndonesiaRe is fully-owned by the Government of Indonesia. IndonesiaRe was first established in 1985 as PT Asuransi Ekspor Indonesia (Persero) or ASEI. The name of PT Reasuransi Indonesia Utama (Persero) officially established in 2016 along with the amalgamation of PT Reasuransi Internasional Indonesia (ReINDO) into PT Reasuransi Indonesia Utama (Persero). IndonesiaRe's head office is registered at Jl Salemba Raya No 30, Jakarta Pusat. As of December 2016, IndonesiaRe has 2 subsidiaries; PT Asuransi ASEI Indonesia and PT Reasuransi Syariah Indonesia. 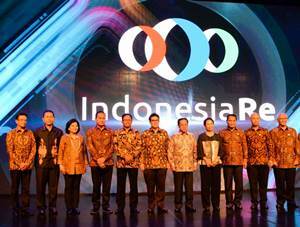 According to PT Reasuransi Indonesia Utama (Persero) Consolidated Financial Report 2016 as cited by JobsCDC.com, IndonesiaRe posted an increase of 22.25% in total underwriting revenues from Rp2,093.28 billion in 2015 to Rp2,559.22 billion in 2016. Total comprehensive profit amounted to Rp290.50 billion in 2016, which represented an increase of 39.17% over total comprehensive profit recorded in 2015 of Rp208.72 billion. Meanwhile, total assets of the Company grew by 8.56% to reach Rp7,102.55 billion as at year-end 2016 as compared with Rp6,542.31 billion in 2015. Candidate must possess at least Bachelor's Degree (S1) majoring in Economics, Mass Communications or equivalent. Minimum 1 year of experience in the related field is required for this position, preferably Staff (non-management and non-supervisor) specialized in Marketing/Business Development or equivalent. Age 21 to 28 years old. Have a strong analytical skill. JobsCDC.com now available on android device. Download now on Google Play here. Please be aware of recruitment fraud. The entire stage of this selection process is free of charge. PT Reasuransi Indonesia Utama (Persero) - Technical Assistant IndonesiaRe December 2017 will never ask for fees or upfront payments for any purposes during the recruitment process such as transportation and accommodation.